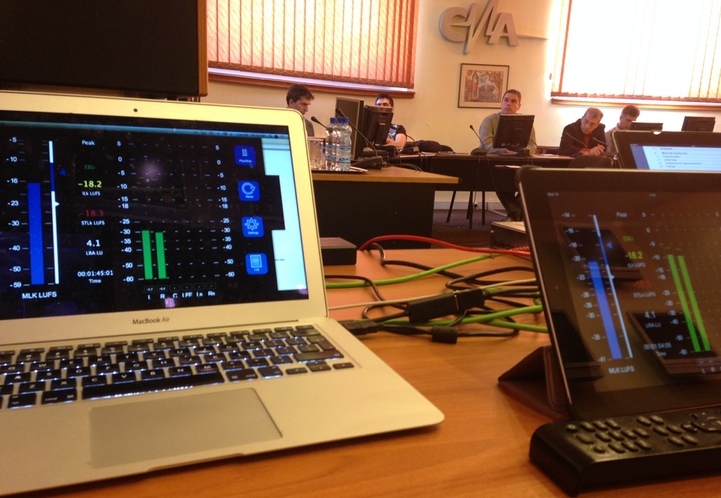 On the 15th of November 2013, the BeDSP Team took part in a one-day workshop on ”Loudness and measurement technics – ITU BS1770 and EBU R128”. The event was organized by the National Audiovisual Council of Romania (CNA), through the LOUDNESS Working Group, and brought together the technical staff members of the most important romanian television networks and media services providers. The participants had the chance of finding out important aspects regarding the loudness levels in broadcasted programs and about the Loudness Recommendation EBU R128, which was recently adopted by the National Audiovisual Council of Romania. The workshop’s presentation program included acoustic topics (sound as a physical phenomenon, loudness perception, hearing dynamic range), notions about loudness and about the characteristics of the digital sound and audio signal, alongside specifications of BS1770 Loudness Standard and EBU R128 Recommendation. The theoretical aspects regarding loudness and human perception were presented by Professor Dr. Eng. Cristian Negrescu, Dean of the Faculty of Electronics, Telecommunications and Information Technology, Politehnica University of Bucharest, while Eng. Mihai Dumitru, from the Romanian Radio Broadcasting Company demonstrated the loudness applications in FM broadcasting domain. The importance of loudness metering and normalization was well demonstrated, with practical examples, by Andrei Constantinescu, sound engineer and loudness expert. He talked about different loudness meters and introduced, to the participants attending the event, different loudness metering and normalization equipments – TC Electronic and BeDSP. He also gave workflow examples for obtaining and correcting the loudness levels in every stage of the broadcasting, from production to distribution and transmission. Practical examples were possible due to the equipment made available by A.V. Audio Sys – loudness metering equipment (TC Electronic LM6, BeDSP ALM 5.1), File Base Normalization (BeDSP), Real time processing (TC Electronic DB6), ProTools 11, Dynaudio AIR20, Sound Devices Pix240.